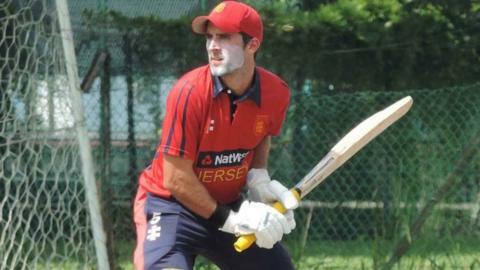 Coach Neil MacRae feels Jersey are good enough to win next month's European Twenty20 Division One tournament on the island. The hosts have three debutants - Ben Rive, Rhys Palmer and Dominic Blampied - in their 14-man squad for the event. The winners of the six-team tournament will go on to the global qualifying tournament for the 2016 T20 World Cup. "We can think we've got a great chance, we have players who are really suited to the Twenty20 format," said MacRae. "It's the top six teams in Europe, whereas previously it was 12," MacRae told BBC Sport. "It's a good thing because we want to take on all the top sides and this is a fairly condensed format with double-header games. "We think it's a good format and we're delighted to be playing at home. "In the last two European T20s, Italy and Denmark have made the final, so historically they're strong, we're aware of those two teams, but in T20 in any given game everyone's a dangerous opponent." Jersey squad: Peter Gough (capt), Dominic Blampied, Corne Bodenstein, Corey Bisson, Ed Farley, Jonty Jenner, Anthony Hawkins-Kay, Ben Kynman, Tom Minty, Rhys Palmer, Charles Perchard, Ben Rive, Ben Stevens, Nat Watkins.